Berlin in the spring of 1939. Hitler is preparing for war. Colonel Noel Macrae, a British diplomat, plans the ultimate sacrifice to stop him. The West’s appeasement policies have failed. There is only one alternative: assassination. The Gestapo, aware of Macrae’s hostility, seeks to compromise him in their infamous brothel. There Macrae meets and falls in love with Sara, a Jewish woman blackmailed into becoming a Nazi courtesan. Macrae, a British diplomat finds himself trapped between the blind policies of his government and the dark world of betrayal and deception in Berlin. As he seeks to save the woman he loves from the brutality of the Gestapo, he defies his government and plans direct action to avert what he knows will be a global war. 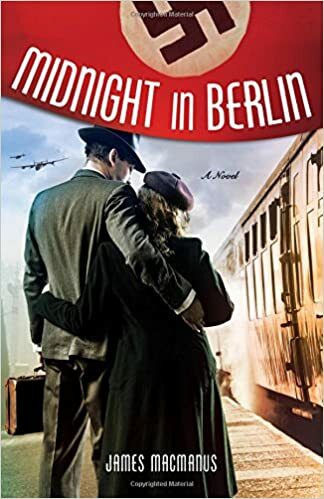 Inspired by true events and characters, Midnight in Berlin is a passionate story that will leave you in awe of the human capacity for courage, sacrifice, and love set against the world. My favorite genre to read is historical fiction set in the WWII era. So when I saw Midnight in Berlin, I knew it would be a book I couldn't put down. And I was completely right! I loved that it was based on true events and characters and I really got into the characters and could really feel their courage, fear, and love throughout the book! It was well written and I could really feel the passion and knowledge that the author, James MacManus, has as he wrote this book!